I (along with millions of others) spent the first weekend of April watching General Conference. As always, I enjoyed the messages from the various speakers. Elder Jeffrey R. Holland gave the concluding remarks. Years ago, when I was a student at Brigham Young University, Jeffrey R. Holland was known as President Holland, because he was serving as the president of BYU. While president, he also taught one class each semester: a Book of Mormon class, mainly comprised of freshmen. Somehow I managed to enroll in that class. I have some specific, rather funny memories, such as the time that President Holland called on me every day for about a week to give the closing prayer (even my classmates noticed, and started whispering my name before he would ask me), or how President Holland described himself as a "marshmallow" when it came to grading religion classes. 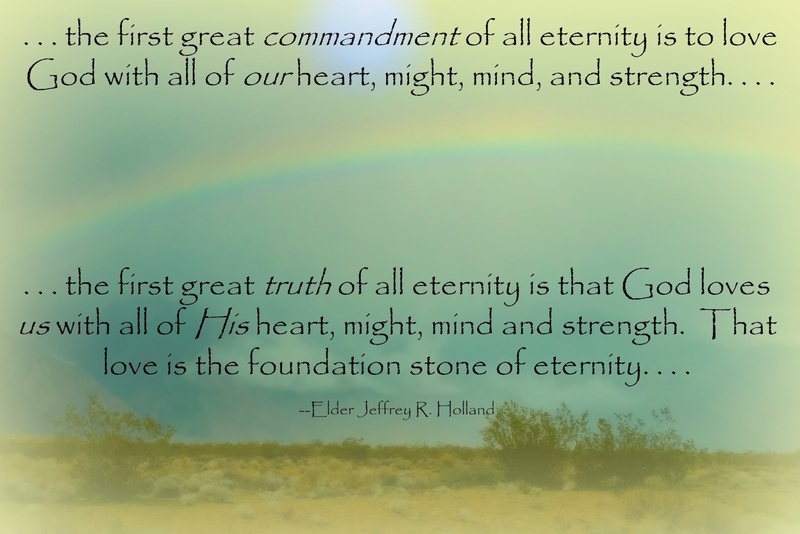 The overwhelming memory I have, though, wasn't of a specific incident, but rather how President Holland always conveyed his love of the Lord, and taught us that the Lord loved us. Whenever I hear Elder Holland speak in General Conference, I think back to that first semester of my freshman year at BYU. The talk he gave last month was as encouraging and positive as I remember his class was. He spoke of the heart of the gospel: love. ". 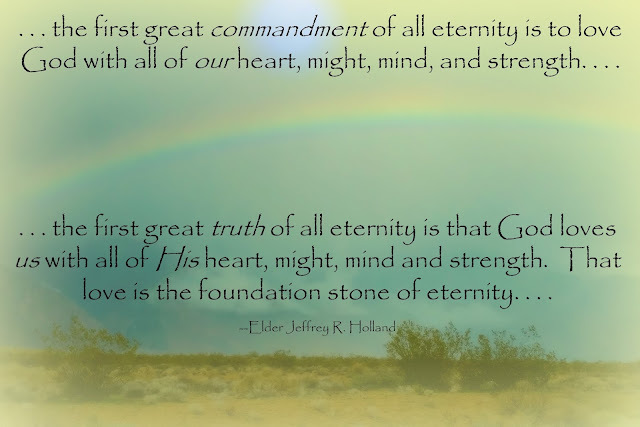 . . the first great commandment of all eternity is to love God with all of our heart, might, mind, and strength. . . . the first great truth of all eternity is that God loves us with all of His heart, might, mind, and strength. That love is the foundation stone of eternity. . . ."
When I go visiting teaching this month, that is the message I plan on sharing. God loves us, and everything builds on that. I have wonderful memories of some favorite professors, too. I love Elder Holland's talks! Sometimes his words comfort me, other times they give me a much needed spanking, but almost always his words speak to my soul. Teachers can have a wonderful impact -- and I bet you will.